Will Smith, Margot Robbie, Adrian Martinez, Rodrigo Santoro in a film directed by John Requa and Glenn Ficarra. Nicky Spurgeon (Will Smith) is a seasoned con-man who becomes romantically involved with an attractive young woman (Margot Robbie); while introducing her to the tricks of his con man trade, she gets too close for comfort and he abruptly breaks it off. Three years later, the former flame shows up in Buenos Aires as the opposing side of the same scam: a billionaire international race car owner (Rodrigo Santoro), throwing his plans for a loop. Once upon a time, Will Smith was the biggest star in the world, but in the years between “The Pursuit Of Happiness” and this new movie, “Focus,” his star hasn’t so much fallen as it has just been diminished by a sea change in both what we look for in celebrity and the types of movies that make $500 million these days. I’m sure Smith thought “After Earth” was going to be that movie fit for this new cinema world, but people saw it as nothing more than faux scientific gibberish and nepotism. “Focus” comes off like an apology movie. 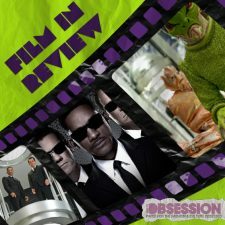 It’s the movie that’s meant to curry favor with the country and show everyone that Will Smith can still be the star you need. It almost works: the movie is full of peaks and valleys; it can be exciting at times and dull at other times. This is the most obvious showcase for Will Smith’s next career phase and it’s clear he doesn’t know what he wants that phase to be. “Focus” stars Smith as Nicky Spurgeon, a veteran con man with a gambling problem that’s never really explored (except to set up a sequence mid-film), who’s made a living on countless small-scale crimes of pocket picking, credit card fraud and deliberate manipulation of unsuspecting victims. He meets a beautiful, stiff novice who wants to enter this world, named Jess (Robbie), who’s obviously attracted to a life of crime as well as to this man who’s supposed to be her mentor. He shows her slight of hand and mental manipulation tricks effective enough to help her rob a “mark.” She picks up on it quickly because the movie needs her to pick up on it quickly, the movie needs to do everything quickly so it can fit a lot of things in. The two fall for each other and after a string of jacks and a somewhat large heist, Nicky has to break ties with Jess and abandon her because you never get attached in these sorts of enterprises. Three years later, the two lovers meet again in the midst of another con that Nicky is pulling with a race car owner named Garriga (Rodrigo Santoro). Jess is now with Garriga and Nicky is thrown off his game by her appearance and is trying his best to get his act together to pull this new con off. The biggest takeaway from this film is that there’s something about Will Smith that just doesn’t click the same way anymore. He’s still charming, he’s still handsome, he’s still funny but the spark isn’t the same. Time has taken the twinkle in his eye. You’re always aware that you’re watching a movie now. There are times when he gives you that twinge and he sells you on the idea that he is in control of everything happening on screen. This is a deeply silly movie but he’s up for the ride. He never presses on the gas but he’s behind the wheel and he’s driving through the storm and no matter how flimsy the movie gets, you always trust him to pull you through. Something does feel just a tad bit off though. I don’t know what the next stage of the Smith career is. Can he pull off the Denzel Washington late period stage or does he need to go in a different route? For all this movies contrivances and goofiness, the movie only works in spite of itself. I don’t think the movie is in on what’s funny about it but at least it is not completely humorless. You just leave wishing Will Smith was given something more. Focus opens today in theaters everywhere.